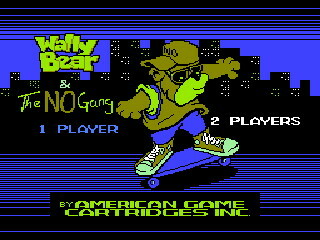 Released in 1992, Wally Bear and the NO Gang is an unlicensed, purely American, anti-drug infotainment masterpiece. You, being an awesome, fuzzy teenager, have to find all your friends for a party. However, you fight against various suburban and city wildlife, all of which wants to get you hooked on drugs. If you get hit once, you lose a life: very realistic. Best time: Single-segment 0:06:23 by 'darbian' on 2014-08-03.